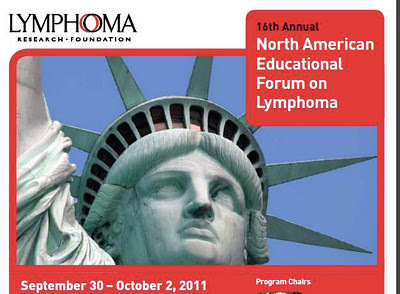 The Lymphoma Research Foundation is to be commended on putting on another first rate conference. What I like is that while it is totally oriented to help the patients and caregivers in the audience, it tells it like it is. They may start at the very beginning of the story, for example retelling the very basics on how a mAB (monoclonal antibody such as rituximab) works, but soon they are into the gritty details on how it might be improved upon with the next generation mAB. They don't oversimplify. Much, but not all is not sugar coated. It does try to be righteously upbeat, but like an an appointment with a good and clever oncologist, you somehow leave feeling positive about the bad news that was just delivered. So let me hit some headlines. CART19 therapy (the patient's own T-cells infected with a retrovirus to be re-educated to multiply and to attack B-cells and then re-injected into the same patient) out of U Penn has all the CLLers drooling. You knew that there would be a million questions. Dr. Bruce Cheson tells it like it is: "The plural of anecdote is not data". One case reported in NEJM does not signal a cure. This approach has way too few and is way too new to say anything definite about. Still it does prove it can be done, not much else. It is a proof of concept study and I am most grateful for its success. I and others ask how long can you go infection free with no B cells? Are there better targets that hit only the CLL cells and not all B lymphocytes? ROR1 for example? Answers are a long ways off. The next trial will be taking in only 11 volunteers. Unlike nearly all cancer trial, where recruitment can be very slow and difficult, what do bet they will have no problem filling their enrollment? I bet they fill up faster than the pre-orders for the new Iphone. Dr. Cheson gave the very opinionated and informative breakout talk on CLL. He is out of Georgetown and has made many important contributions to our knowledge of how to treat CLL. One that he is particularly proud of is his bringing the old East German drug- bendamustine to the USA. As he points out in communist Germany, bendamustine was developed in the 1960s to be an inexpensive alkylating agent instead of using the then expensive western drugs such as Cytoxan (cyclophosphamide) or Leukeran (Chlorambucil). Those are both off patent now and dirt cheap for a chemo drug. But ironically, we have Treanda (branded bendamustine), a very pricey child of mustard gas that may have some extra oomph in managing CLL and other hematological disorders. The TATA has become the Ferrari. A short cautionary note before I share his thoughts and slides. Chaya Venkat may have been the first and the most public, but not the last in understanding and teaching that there is great localism and nepotism in what treatments for CLL we are offered. If you go to MDACC, you can bet you will be offered FCR and if you show up at Georgetown, expect to see Bendamustine on your infusion schedule. That is not a bad thing. I want my doc to be very familiar with all the unfamiliar things that might happen to me with my treatment protocol. I want him or her to feel comfortable and upbeat about the therapeutic choice. So please take into account Dr. Cheson's understandable pride and enthusiasm for his prodigy drug. He admits that the data is not there yet, but he thinks it is trending to show that BR may be a better front line therapy that FCR. More patients can get through a full course of therapy of BR than FCR. When you look at the data on FCR, always check how many make it though a full six cycles. It is safer in patients with renal insufficiency. There may be less treatment related ALL and MDS. That would be a very good thing. He believes that auto-immune issues also will be less and that there is less marrow suppression and fewer infections. I will post soon on what I learned in Brooklyn on new CLL therapies and transplants and survivorship. And on the whole ambience and joy in seeing old friends. They even had good vegan food! I took the redeye on Jet Blue from Long Beach to JFK and stayed awake on Saturday and got up early on Sunday before flying back home and I am glad that I did. I think all those years as a medical student and intern and resident and fellow has trained me to get by on little sleep. And to be always be learning. It is too soon for any BR results at ASH this year? And will you say more on CAL-101? Thanks for going and reporting! It is too soon for BR at ASH, but I am hoping to attend and report from the meeting on a ton of other stuff. Thanks !! What I don't understand is, if B was in use for 40+ years, isn't there lots of data on results of patient treatment? Does anyone address this archival information? My understanding is that everything needs to be redone for the USA. Remember also that R was not a factor for chemo-immune therapy 40 years ago.